Drug-dependent people show decreased behavioral and brain reactivity to natural rewards compared to non-drug users. As a result, drug-dependent users increasingly focus their attention on obtaining the drug instead of attending to natural rewards. Recent research shows that a cognitive-based intervention may help restore natural reward processing in opioid-dependent participants. 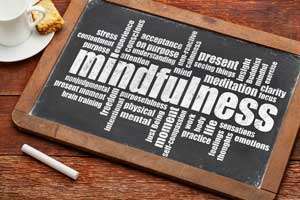 In this study, chronic pain patients at risk for opioid misuse were randomized to either eight weeks of a Mindfulness-Oriented Recovery Enhancement (MORE) intervention or to an eight-week support group (control). Participants in the MORE intervention used mindfulness meditation to focus on all sensory features of a pleasant experience or object (for example, a beautiful nature scene like a sunset), while reflecting on any positive emotions arising in response to the pleasant event. The support group discussed topics and emotions related to chronic pain and opioid use/misuse. Following these interventions, all participants were shown images representing natural rewards (such as endearing animals, appealing foods, landscapes) or neutral images (furniture, neutral facial expressions, or household items). Researchers measured late positive potential (LPP) brain activity, which reflects attention to emotionally salient information, while participants viewed these images. In comparison to the control group, participants completing the MORE intervention showed greater LPP responses to natural reward images relative to neutral images and greater the LPP responses predicted reduced opioid cravings as reported by the participants. These results suggest that teaching people who misuse opioids to mindfully attend to positive aspects of their life may increase the perceived value of natural rewards – processes that may be diminished in those facing chronic pain or addiction – which may in turn help them to control opioid cravings. Neurophysiological evidence for remediation of reward processing deficits in chronic pain and opioid misuse following treatment with Mindfulness-Oriented Recovery Enhancement: exploratory ERP findings from a pilot RCT; Eric L. Garland, Brett Froeliger, Matthew O. Howard; Journal of Behavioral Medicine; Published Online: November 11, 2014.